Henry Moret (1856–1913), Heavy Weather at Saint Grenoble, Point de Penmarc'h (1905), oil on canvas, 73.7 x 100.6 cm, Private collection. The Athenaeum. 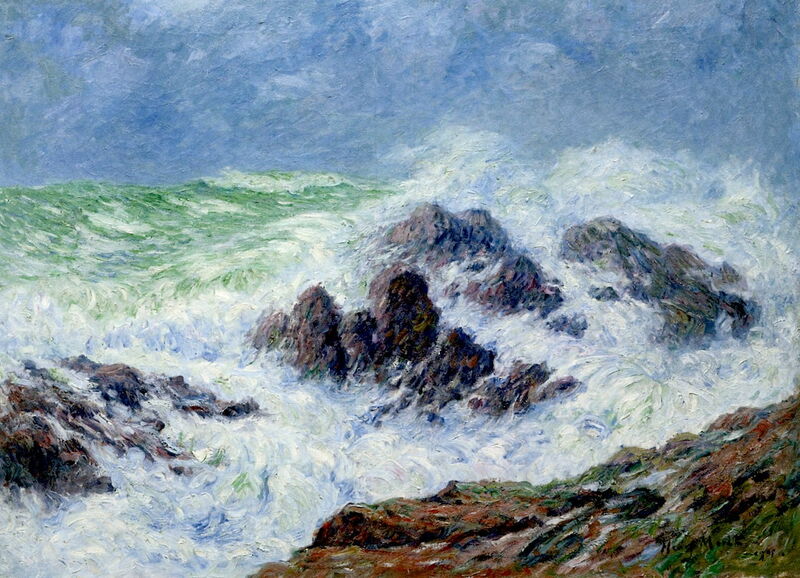 The coast of Brittany was one of Claude Monet’s favourite sources of powerful motifs, where he painted in all weathers, and produced some of his most effective landscape works. 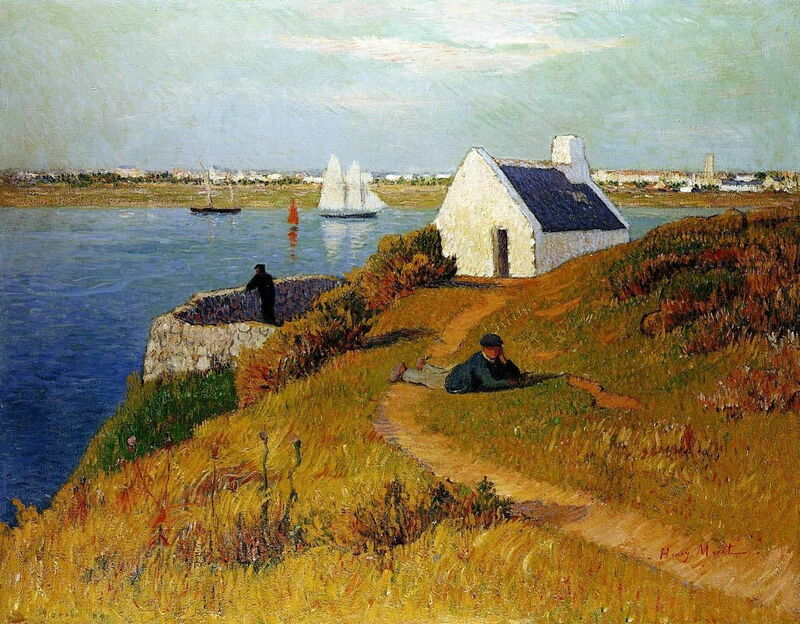 It was also what made Henry Moret (1856–1913) successful, and his paintings worth viewing. Moret wasn’t a Breton by birth, but came from the other large peninsula in the north of France, Cherbourg. His artistic leaning was recognised when he was serving in the military, in the Breton port of Lorient, and he started to learn to paint with a local artist. He began his studies at the École des Beaux-Arts in Paris in 1876, where he was taught by Jean-Léon Gérôme, and later by Jean-Paul Laurens, among others. His early work seems to have vanished, but by all accounts was in Salon style, and nothing particularly innovative. 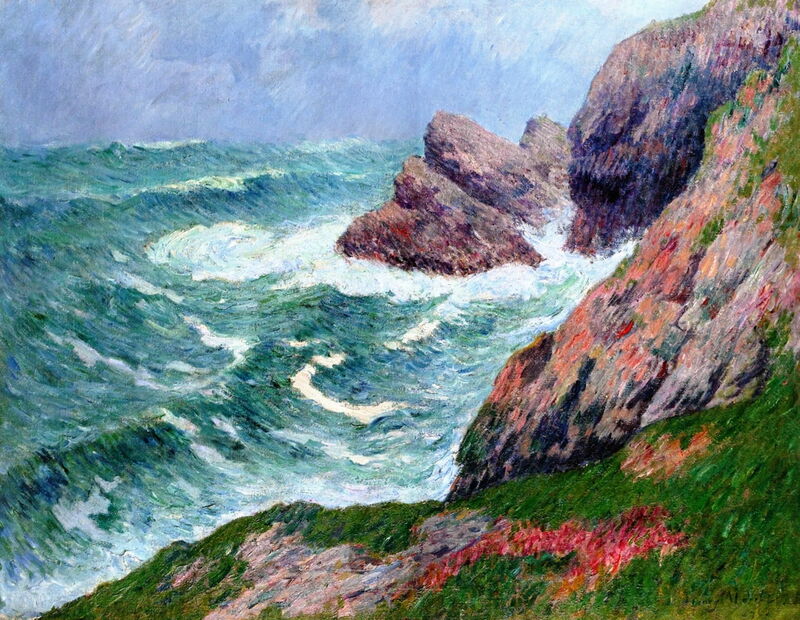 However, he became fond of Brittany, and in 1888 went to the artists’ colony at Pont-Aven, fom where he moved to the Breton coast at Le Pouldu, at the northern end of the Bay of Biscay. 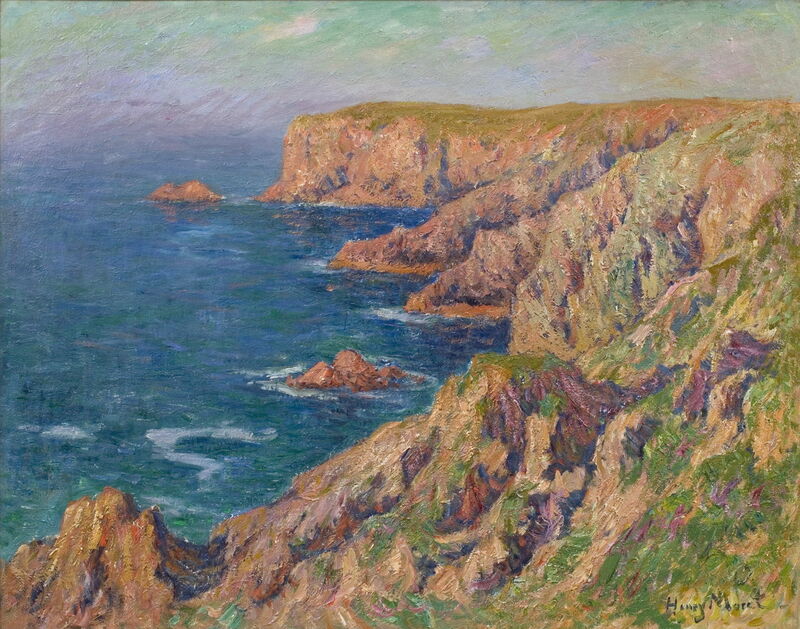 From 1890, he increasingly concentrated on painting the countryside and coast of Brittany. 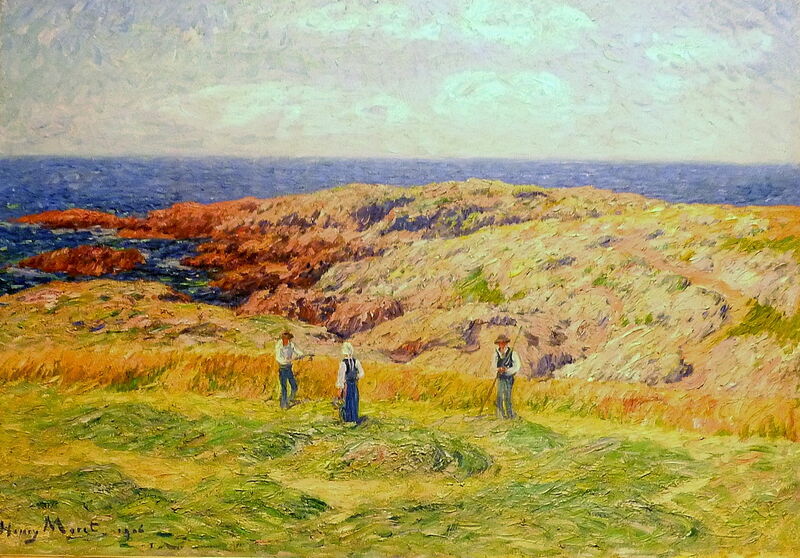 Henry Moret (1856–1913), Young Bretons (c 1900), further details not known. Wikimedia Commons. Young Bretons (c 1900) uses a style which would appear more typical of his early work from before 1890, perhaps when he was still at Pont-Aven, although it is claimed to date from much later. 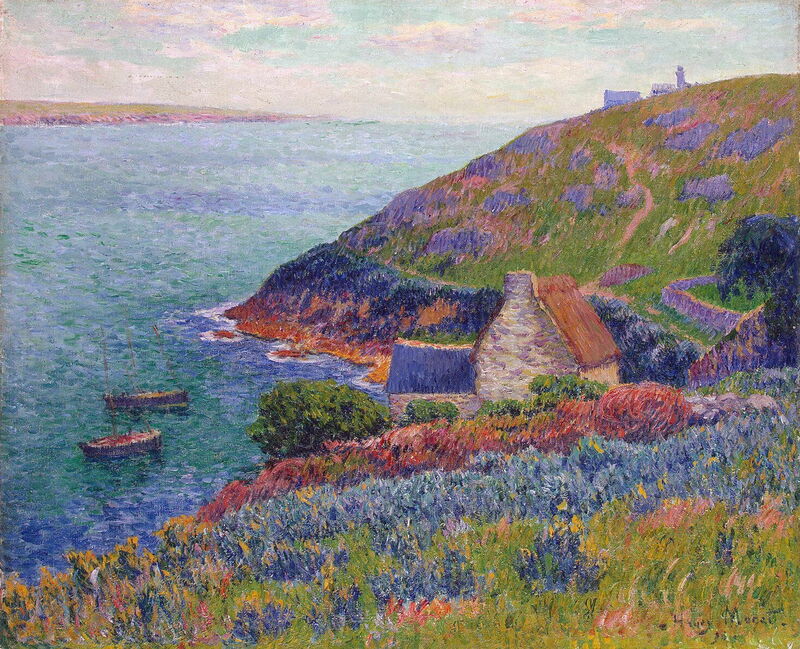 Henry Moret (1856–1913), La Côte Sauvage, Groix (1891), oil on canvas, dimensions not known, Private collection. The Athenaeum. 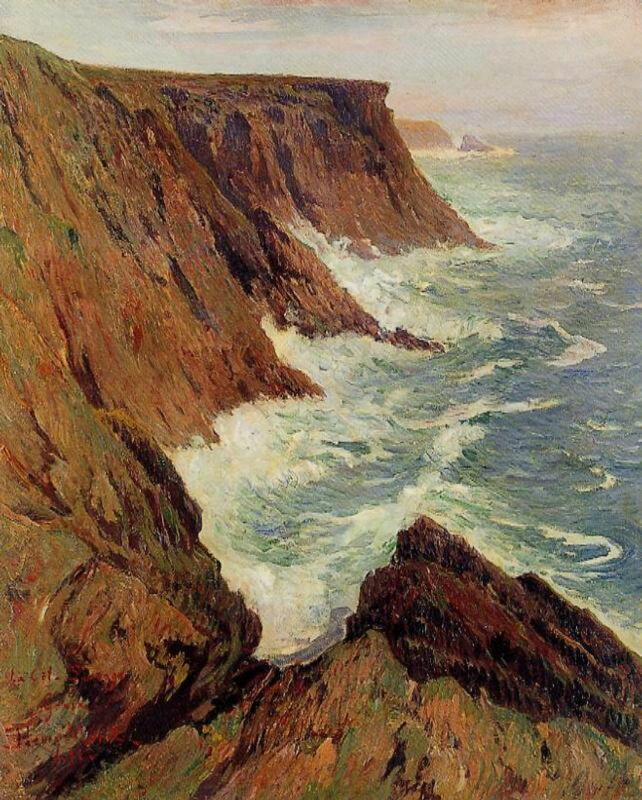 La Côte Sauvage, Groix (1891) shows the Atlantic swell rebounding off the foot of sea cliffs on the ‘savage coast’. There is a mystery over where this is located, as its title appears ambiguous. There are several sections of coast known as La Côte Sauvage, none of which is on the island of Groix, off the Breton coast. Henry Moret (1856–1913), The Island of Raguenez, Brittany (1890/1895), 54 x 64.8 cm, National Gallery of Art, Washington, DC. Wikimedia Commons. The Island of Raguenez, Brittany (1890/1895) shows a tiny island off the coast not far from Pont-Aven, between Quimper and Lorient. At this early stage of his landscape painting, Moret’s style is reminiscent of the Impressionists during the 1870s, his brushstrokes resembling those of Cézanne during his campaigns around Paris. Henry Moret (1856–1913), The Cliffs at the Île de Groix (1894), oil on canvas, 73 x 60 cm, Private collection. The Athenaeum. 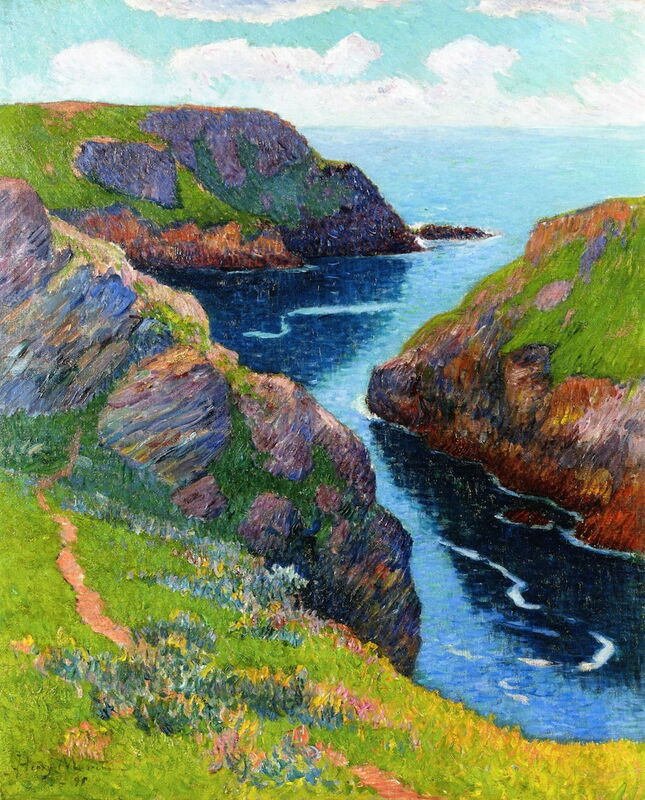 Moret is one of the few artists to have painted Groix, an island off the coast of Lorient. 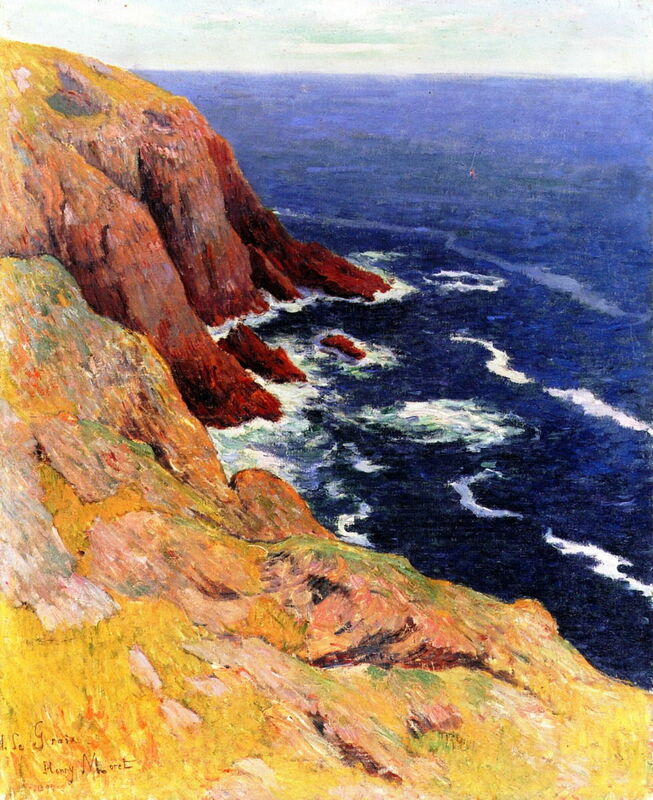 The Cliffs at the Île de Groix (1894) shows some of its cliffs, with Moret’s colours starting to intensify, and his brushstrokes becoming more prominent. Henry Moret (1856–1913), Lorient Harbour (1895), oil on canvas, further details not known. Wikimedia Commons. In Lorient Harbour (1895), Moret’s style continues to evolve away from older Impressionism, with passages in which his brushstrokes and colour are more typical of Vincent van Gogh, perhaps. Henry Moret (1856–1913), Port de Volendam (c 1895), oil on canvas, further details not known. Wikimedia Commons. 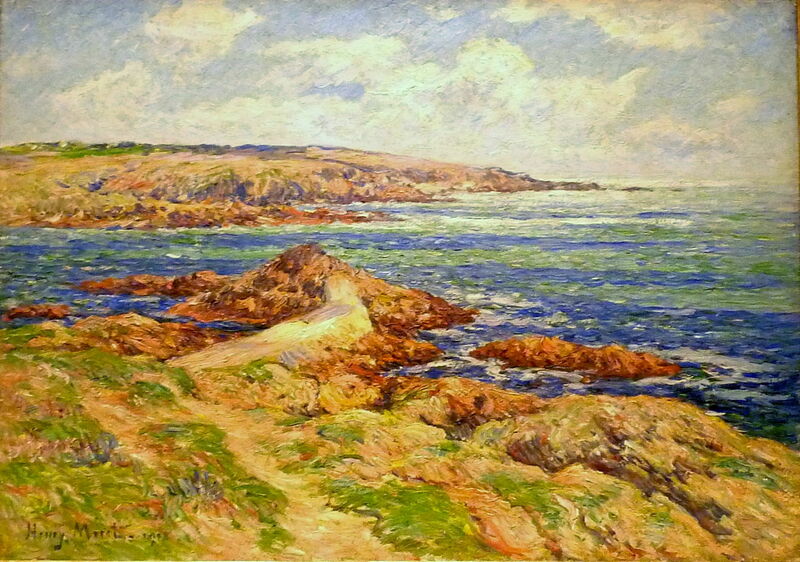 Moret also visited other coastal areas to paint. 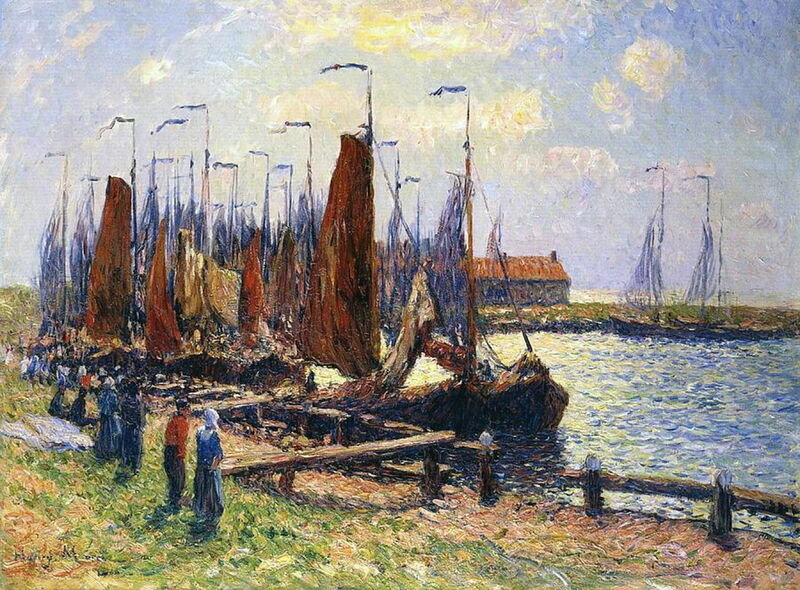 Port of Volendam (c 1895) shows a fleet of small fishing boats crowded together in the harbour of this small town in North Holland. Its flat landscape could not have been a greater contrast with Brittany. Henry Moret (1856–1913), Waves at Pen-men, Île de Groix, (1896), oil on canvas, 73.3 x 92.2 cm, Private collection. The Athenaeum. Waves at Pen-men, Île de Groix (1896) shows the far western tip of the island of Groix, with the mountainous sea for which this part of the Bay of Biscay is notorious. Moret’s colours continue to intensify. 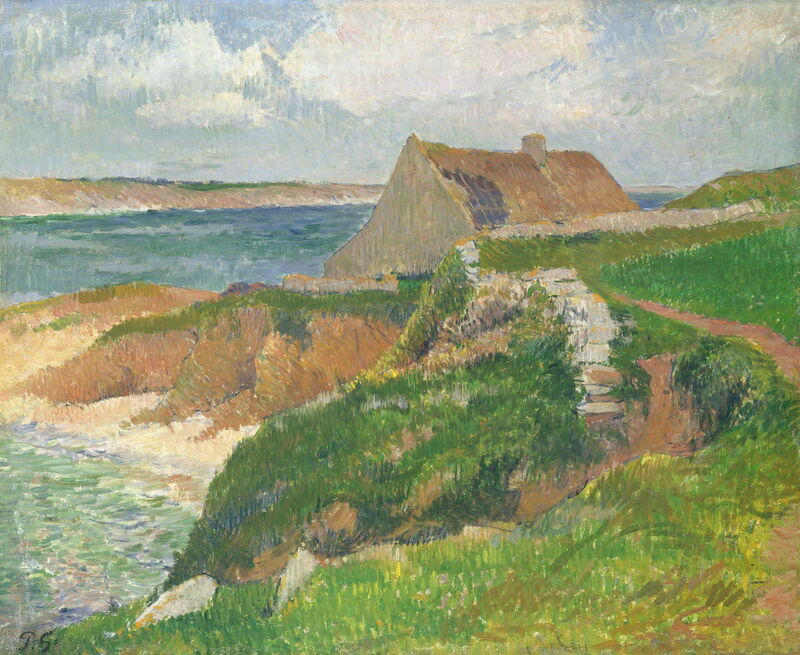 Henry Moret (1856–1913), Belle-Île (1898), oil on canvas, 73.5 x 60 cm, Private collection. The Athenaeum. 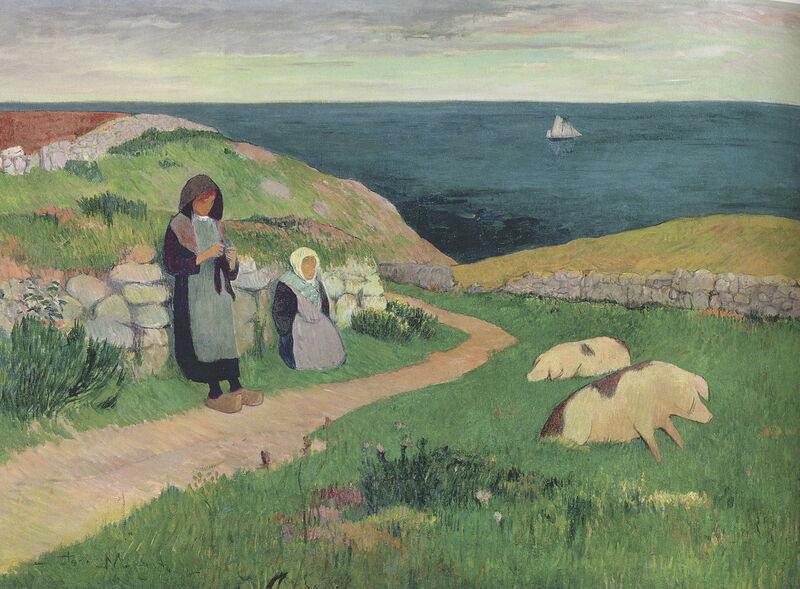 Belle-Île (1898) shows fine summer weather on the island of Belle-Île-en-Mer, to the south-east of Groix. Monet stayed here for ten weeks in 1886, one of his formative periods of painting en plein air. 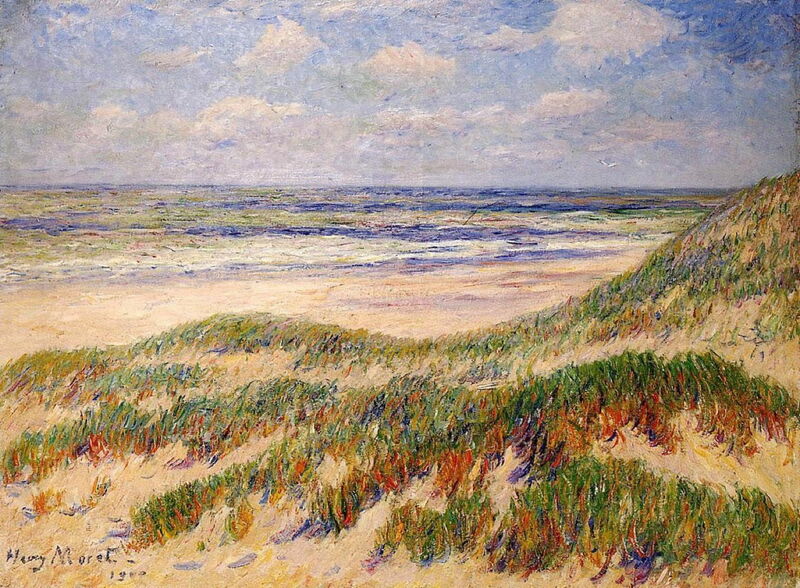 Henry Moret (1856–1913), The Dunes at Egmond (1900), oil on canvas, further details not known. Wikimedia Commons. Moret returned to the flatlands of North Holland around the turn of the century, when he painted The Dunes at Egmond (1900) on the sandy coast near Alkmaar. This was also an artists’ colony at the time. He is now starting to include brushstrokes of complimentary colours, and his colours continue to intensify. Henry Moret (1856–1913), The North Sea (1900), oil on canvas, further details not known. Wikimedia Commons. 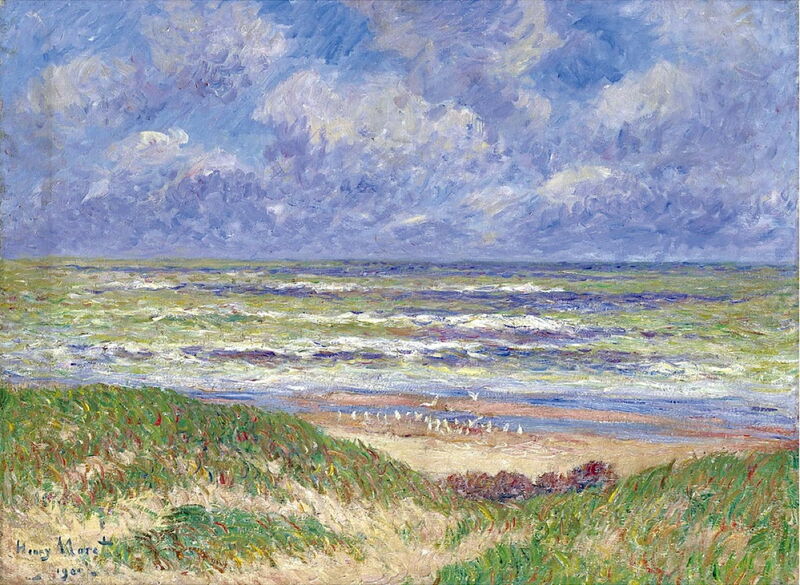 The North Sea (1900) is another view, presumably, of the coast of North Holland near Egmond. Henry Moret (1856–1913), Port Manec’h (c 1900), oil on canvas, further details not known. Wikimedia Commons. Port Manec’h (c 1900) is at the entrance to the river Aven, which leads up to Pont-Aven. Moret’s colours are now intense under the summer sunshine. Henry Moret (1856–1913), The Port of Audierne (c 1900), oil on canvas, 38 x 55 cm, Private collection. Wikimedia Commons. The Port of Audierne (c 1900) is in the far west of the Brittany peninsula, beyond Quimper. Much of this canvas is covered by vigorous marks of concentrated colour. Henry Moret (1856–1913), Gros temps à Doëlan (Heavy Weather at Doëlan) (date not known), oil on canvas, dimensions not known, Musée des beaux-arts de Vannes, Vannes, France. Wikimedia Commons. 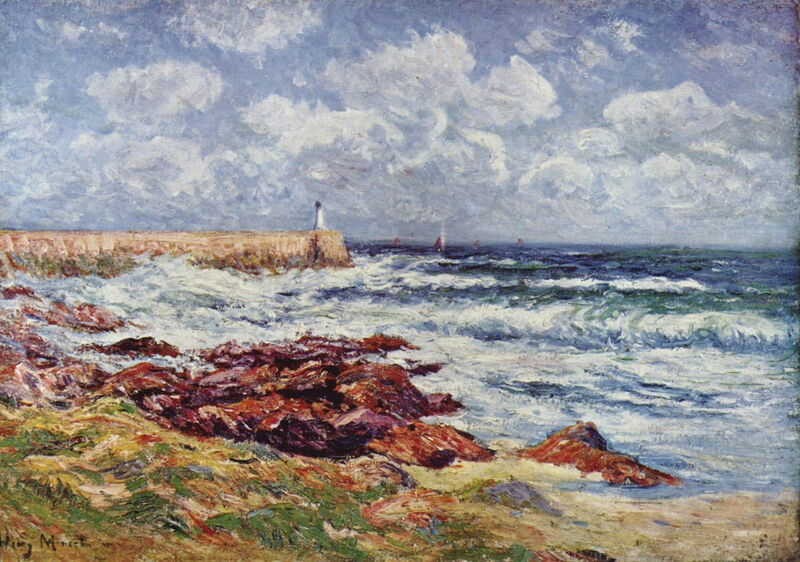 Moret’s undated Heavy Weather at Doëlan shows the mainland coast near the island of Groix, with another rough sea being driven in by the wind. Henry Moret (1856–1913), Île de Groix (date not known), oil on canvas, 94 x 111 cm, Kunsthaus Bühler, Stuttgart, Germany. Wikimedia Commons. This undated view of the cliffs on Île de Groix was probably painted at about this time too. Henry Moret (1856–1913), Ponte de la Sirene, Belle-Île-en-Mer (1904), oil on canvas, 72.1 x 90.2 cm, Private collection. The Athenaeum. 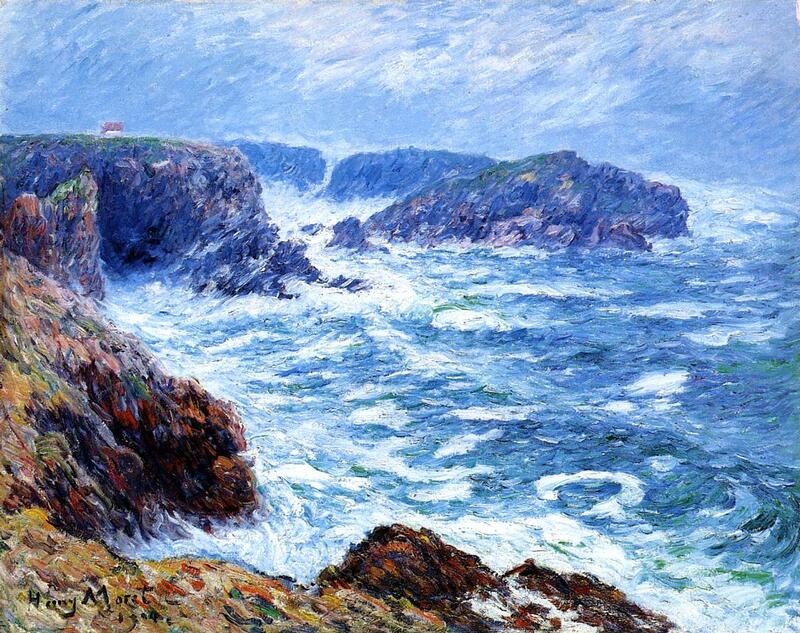 Ponte de la Sirene, Belle-Île-en-Mer (1904) shows another storm sea, this time on the windward side of Belle-Île. Henry Moret (1856–1913), Heavy Weather at Saint Grenoble, Point de Penmarc’h (1905), oil on canvas, 73.7 x 100.6 cm, Private collection. The Athenaeum. Heavy Weather at Saint Grenoble, Point de Penmarc’h (1905) shows enormous seas breaking at this point to the south-west of Quimper, almost at the northern terminus of the Bay of Biscay. Henry Moret (1856–1913), Haymaking in Brittany (1906), oil on canvas, dimensions not known, Musée des beaux-arts de Vannes, Vannes, France. Wikimedia Commons. Haymaking in Brittany (1906) has a particularly rough facture, and the high chroma typical of Moret’s later work. Henry Moret (1856–1913), Entrance to the Port of Doëlan (1908), oil on canvas, dimensions not known, Musée des beaux-arts de Quimper, Quimper, France. Wikimedia Commons. 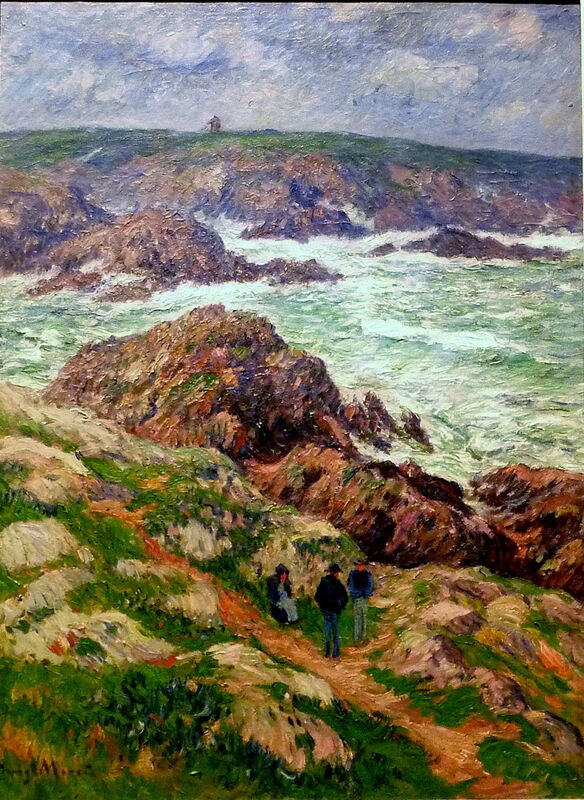 Finally, Moret’s view of the Entrance to the Port of Doëlan from 1908 catches the bright sunshine of a more temperate day. Moret was successful in his lifetime, with Durand-Ruel selling many of his 600 or more oil paintings to clients in Europe and in America. A few have made their way into public collections, but the rise of modernism in the twentieth century pushed his work back to near-oblivion for a long time. His paintings capture the ruggedness and exposure of these wild and beautiful coasts as well as anyone’s, even those of Claude Monet. Posted in General, Painting and tagged coast, landscape, Monet, Moret, painting, Post-impressionism, van Gogh. Bookmark the permalink.